WASHINGTON, January 16, 2019	(Newswire.com) - With growing interest in mass timber and tall wood buildings, WoodWorks – Wood Products Council has partnered with the Chicago Regional Council of Carpenters Apprentice and Training Program to provide mass timber installer training to construction professionals in the Greater Chicago area. 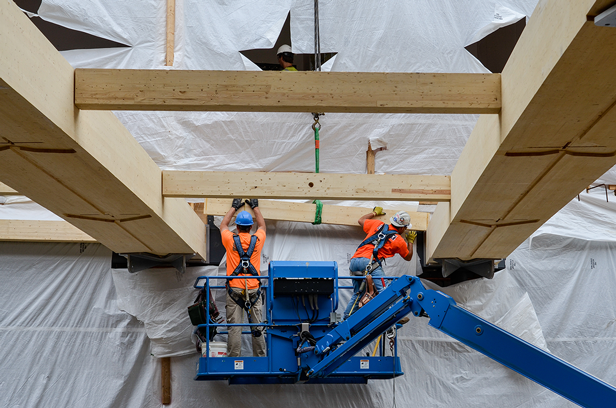 Intended to serve as a model for training across the U.S., the program will help ensure the availability of experienced construction professionals to meet increasing demand for buildings made from cross-laminated timber (CLT) and other mass timber products. Beginning in April 2019, installer training workshops will be offered through the Chicago Regional Council of Carpenters’ Apprentice and Training Program Center in Elk Grove Village, Illinois. Workshops will include 56 hours of training, initially focused on CLT, and will be available to apprentice and journeymen carpenters affiliated with union contractors. This initiative is part of a broader WoodWorks effort that encompasses mass timber and other wood building-related training. The initial emphasis on mass timber will include education at the developer level, pre-construction/project management training and installer training. For example, a developer/contractor session is being offered at the International Mass Timber Conference hosted jointly by WoodWorks and the Forest Business Network, March 19-21, in Portland. WoodWorks will also oversee a networking website as part of its Professional Affiliate Program, which will connect individuals who have undergone training with those putting together project teams. WoodWorks has been supporting the mass timber evolution from the outset. In 2015, the program provided technical assistance on a handful of projects where the architect, engineer or developer had an interest in using mass or heavy timber. In 2017, its support had grown to 158 projects, and it supported 219 projects in 2018. As of September, 439 multi-family, commercial or institutional buildings had been constructed out of mass timber or were in design across the U.S.
To participate in mass timber installer training workshops, visit the Chicago Regional Council of Carpenters Apprentice and Training Program. To be kept informed of other training efforts, email help@woodworks.org. Please include profession (e.g., developer, architect, engineer, etc.) and specific training needs if known. WoodWorks – Wood Products Council provides free technical support as well as education and resources related to the code-compliant design of commercial and multi-family wood buildings. WoodWorks staff have the expertise to assist with all aspects of wood building design, including (but not limited to): allowable heights and areas/construction types; structural detailing of wood and hybrid systems; fire resistance and acoustical-rated assemblies; efficient and code-compliant lateral system design; alternate means of code compliance; and energy-efficient detailing. The Chicago Regional Council of Carpenters Apprentice and Training Program provides classroom and hands-on training for pre-apprentice, apprentice and journeymen carpenters at its Elk Grove Village training center. The Chicago Regional Council of Carpenters (CRCC) represents 19 locals with over 35,000 working men and women in 72 counties in Illinois and Eastern Iowa. The CRCC invests in its members by providing programs and classes so that the safest, best-trained and skilled workforce is at the forefront of technology to meet the employment needs of the industry, now and in the future. WoodWorks provides free technical support as well as education and resources related to the code-compliant design of non-residential and multi-family wood buildings.